(1) Uses sensors normally used for attitude only. Very small (or no) added weight and power for navigation sensing. (2) Intent Is to use observation payload sensor. (3) Uses crosslinks on board for intereateMte communications. Would need secondary system untD sufficient number of satellites are in place. (4) Conceptual design only. Would probably use spacecraft computer. The problem of combining orbit and attitude systems is illustrated by Table 11-67, which provides size, weight and power for alternative autonomous navigation systems. Several of the systems, such as the GPS receivers, are orbit-only, although in the future they may be expanded to include attitude as well. Other systems, such as MANS and the Space Sextant do both the attitude and orbit function. In these cases, one should look at the difference in weight and power required to achieve navigation from that required for attitude alone. Even this assessment is complicated because orbit determination requires computer resources which may be regarded as a part of the attitude control system, the navigation system, the command and data handling system, or the general spacecraft computer. For many of the systems, such as landmark tracking or crosslink navigation, the computer is the principal element associated with autonomous navigation and control. The main message is to avoid "double booking" components for guidance and navigation and to look at the joint implementation of orbit and attitude determination and control when beginning to optimize system performance. Autonomous navigation and orbit maintenance is too new to have a standard implementation in terms of where computations are done. But the nature of the computations themselves and the data used suggest a natural configuration: using a single spacecraft processor for determining and controlling the attitude and orbit. These functions will probably use either the same or similar sensors and may use the same actuators. Most of the computing is associated with sensor processing, data handling, and anomaly resolution. The orbit and attitude computations themselves are normally much smaller. The implementation of either orbit or attitude control algorithms represents by far the smallest part of the throughput requirement. Thus, control adds little burden for any processor which is already determining the orbit or attitude. A reasonable initial design would incorporate all of these functions in a single spacecraft processor. Actual implementation may vary, depending upon the specific hardware and software. For example, star-sensor processing may be incorporated within the star sensor itself, or may be done in the same processor as other orbit or attitude functions. The overall objective, however, should continue to be to minimize the cost and risk of determining and controlling the orbit and attitude for the entire mission. Anthony, Jack. 1992. "Autonomous Space Navigation Experiment." Paper No. AIAA 92-1710 presented at the AIAA Space Programs and Technologies Conference. Huntsville, AL, March 24-26. Battin, Richard H. 1999. An Introduction to the Mathematics and Methods of Astro-dynamics. New York: AIAA Education Series. Booker, R. A. 1978. "Space Sextant Autonomous Navigation and Attitude Reference System—Flight Hardware Development and Accuracy Demonstration. Rocky Mountain Guidance and Control Conference." Paper AAS 78-124. Bruhn, E. F. 1973. Analysis and Design of Flight Vehicle Structures. Tri-State Offset Co.
CCSDS 201.0-B-l. January 1987. Blue Book Telecommand Channel Service Part 1 Architectural Specification. Chao, C.C., H. Bernstein, W.H. Boyce, and R J. Perkins. 1992. "Autonomous Station-keeping of Geosynchronous Satellites Using a GPS Receiver." AIAA-92-4655-CP, A92-52106. Chetty, P. R. K. 1991. Satellite Technology and Its Applications (2nd Edition). New York: McGraw-Hill. Chobotov, Vladimir, ed. 1991. Orbital Mechanics. Washington, DC: AIAA. Cboiy, M. A., Hoffman, D. P., Major, C. S. and V. A. Spector. 1984. "Autonomous Navigation—Where We are in 1984." Paper presented at AIAA Guidance and Control Conference, Seattle, WA. August 20-22. Collins, John T., Simon Dawson, and James R. Wertz, 1996. "Autonomous Constellation Maintenance System." Presented at 10th Annual AIAA/USU Conference on Small Satellites, Logan, Utah, September 16-19. Conley, Peter L. 1998. Space Vehicle Mechanisms. New York: John Wiley & Sons, Inc.
Escobal, Pedro R. 1965. Methods of Orbit Determination. Malabar, FL: Robert E. Krieger Publishing Co.
Fortescue, Peter, and John Stark. 1995. Spacecraft Systems Engineering. New York: John Wiley & Sons, Inc.
Gilmore, D.G. 2002. Satellite Thermal Control Handbook, VoL 1: Fundamental Technologies. Los Angeles, CA: The Aerospace Corporation Press. Glickman, Ronald E. 1994. "TIDE: The Timed-Destination Approach to Constellation Formationkeeping." Paper AAS 94-122, presented at the AAS/AIAA Spaceflight Mechanics Meeting, Cocoa Beach, FL, February 14-16.
, Hofmann-Wellenhof, B., H. Lichtenegger, and J. Collins. 1997. GPS Theory and Practice (4th Edition). New York: Springer-Verlag Wien. Hosken, R.W. and J.R. Wertz. 1995. "Microcosm Autonomous Navigation System On-Orbit Operation." Paper AAS 95-074, presented at the 18th Annual AAS Guidance and Control Conference Keystone, CO, February 1-5. Hummel, S.G. 1984. "Spacecraft Autonomous Navigation Using Stellar Refraction Measurements." Paper presented at AIAA Guidance and Control Conference, Seattle, WA. August 20-22. IEEE. 1972. IEEE Standard 100. IEEE Standard Dictionary of Electrical and Electronic Terms. IRIG, Telemetry Group. 1986. IRIG Standard 106 Telemetry Standards. Inter-Range Instrumentation Group, Range Commanders Council. Jordan, J. F. 1981. "Deep Space Navigation Systems and Operations." Paper presented at the ESA International Symposium on Spacecraft Flight Dynamics. May. Kaplan, Elliott D. 1996. Understanding GPS Principles and Applications. Boston, Artech House, Inc.
Kaplan, Marshall H. 1976. Modem Spacecraft Dynamics and Control. New York: John Wiley & Sons. Karam, Robert D. 1998. Satellite Thermal Control for Systems Engineers. Volume 181 in "Progress in Astronautics and Aeronautics." Reston, VA: American Institute of Aeronautics and Astronautics. Königsmann, Hans J., John T. Collins, Simon Dawson, and James R. Wertz. 1996. "Autonomous Orbit Maintenance System." Acta Astronáutica 39:977-985. Leick, Alfred. 1995. GPS Satellite Surveying (2nd Edition). New York: Wiley-Inter-science Publication, John Wiley & Sons. Lin, E. I, J.W. Stultz, and R. T. Reeve. 1995. "Test-Derived Effective Emittance for Cassini MLI Blankets and Heat Loss Characteristics in the Vicinity of Seams." AIAA paper 95-2015, June 19-22. Long, Cappellari, Velez, and Fuchs, eds. 1989. Goddard Trajectory Determination System Mathematical Theory, Revision I. Goddard Space Flight Center and Computer Sciences Corporation. NAS A/Goddard Space Flight Center, Flight Dynamics Division, Code 550. Markley, F. Landis. 1981. "Autonomous Satellite Navigation Using Landmarks." Paper No. 81-205 presented to the AAS/AIAA Astrodynamies Specialist Conference. Lake Tahoe, NV, August 3-5. Martin Marietta Aerospace. 1977. 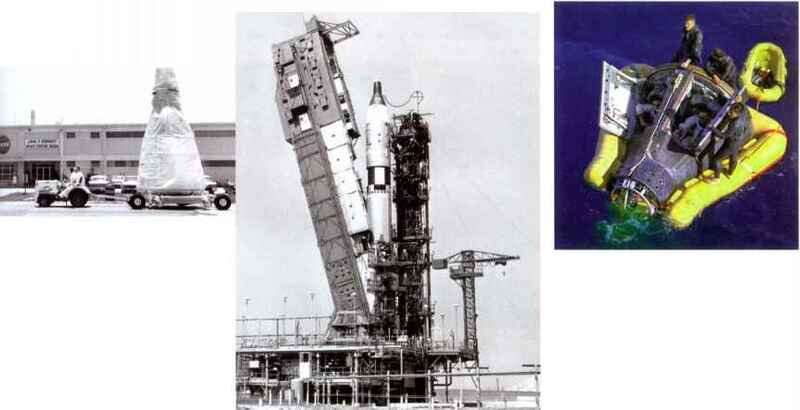 Design and Laboratory Testing of Self-Contained High Altitude Navigation System, Phase 1—The Space Sextant Autonomous Navigation Attitude Reference System (SS-ANARS), Phase 1 Final Report, MCR-77-196. Denver, CO.
MIL-A-83577. 1988. General Specification for Moving Mechanical Assemblies for Space and Launch Vehicles. MIL-HDBK-17B, Change Notice 1, 16 June 1989, Polymer Matrix Composites. Philadelphia: Naval Publications Forms Center. MIL-STD-1582. 1984. Satellite Data Link Standard (SDLS). Miller, M., H. Hanover, K. Patel, and E. Wahl. 1990. "Neptune Encounter: Guidance and Control's Finest Hour." Paper presented at the 13th Annual AAS Guidance and Control Conference. Keystone, Colorado. February 3-7. Morgan, Walter L. and Gary D. Gordon. 1989. Communications Satellite Handbook. New York: John Wiley & Sons. National Aeronautics and Space Administration. 1975. Astronautics Structures Manual, Marshall Space Flight Center, Huntsville, AL: National Aeronautics and Space Administration. National Aeronautics and Space Administration. 1988. TDRSS Users Guide. NASA Goddard STDN 101.2. National Aeronautics and Space Administration, Jet Propulsion Laboratory. 1989. Deep Space Network Interface Design Handbook. Vol. I and n. JPL-DSN 810-5 Revision D.
Noton, Maxwell. 1998. Spacecraft Navigation and Guidance. London: Springer-Verlag. Parkinson, B.S. and S.W. Gilbert. 1983. NAVSTAR: Global Positioning System—Ten Years Later. Proceedings of the IEEE. Vol. 71, No. 10. October 1983. Parkinson, Bradford W., and James J. Spilker, Jr., eds. 1996. Global Positioning System: Theory and Application. Vols. I and n. Washington, DC: AIAA. Pisacane, Vincent L. and Robert C. Moore. 1994. Fundamentals of Space Systems. New York: Oxford University Press, Inc.
Porter, J. P. and W. A. Hite. Overview/Current Status of the NAVSTAR Global Positioning System, IEEE PLANS. 1984. Roark, R. J., and W. C. Young. 1975. Formulas for Stress and Strain (5th Edition). New York: McGraw-Hill. Rolfe, S. T., and J. M. Barsom. 1977. Fracture and Fatigue Control in Structures. Englewood Cliffs, NJ: Prentice-Hall Inc.
Roy, A.E. 1991. Orbital Motion (3rd Edition). Bristol and Philadelphia: Adam Hilger. Sarafin, Thomas P., ed. 1995. Spacecraft Structures and Mechanisms: From Concept to Launch. Torrance, CA, and Dordrecht, The Netherlands: Microcosm Press and Kluwer Academic Publishers. Schildcrout, M. and M. Stein. 1928. Critical Combinations of Shear and Direct Axial Stress for Curved Rectangular Panels. NACA TN 1928. Washington, DC: National Advisory Committee for Aeronautics. Singer, Fred S. 1964. Torques and Attitude Sensing in Earth Satellites. New York: Academic Press. Tai, Frank and Peter D. Noerdlinger. 1989. "A Low Cost Autonomous Navigation System." Paper No. AAS 89-001 presented at the 12th Annual A AS Guidance and Control Conference, Keystone, CO, Feb. 4-8. TOR-0059(6110-01)-3, Reissue H. 1987. Air Force Satellite Control Facility Space/Ground Interface. Tsai, S. W. 1987. Composites Design (3rd Edition), Dayton, OH: Think Composites, Inc.
U.S. Air Force Materials Laboratory. 1987. MIL-HDBK-5E, Metallic Materials and Elements for Aerospace Vehicle Structures. Wright-Patterson AFB, OH: Air Force Materials Laboratory. Vallado, David A. 2001. Fundamentals of Astrodynamics and Applications, (2nd edition). El Segundo, CA: Microcosm Press and Dordrecht, The Netherlands: Kluwer Academic Publishers. Wertz, James R. ed. 1978. Spacecraft Attitude Determination and Control. Dordrecht, The Netherlands: D. Reidel Publishing Company. Wertz, James R., and Wiley J. Larson, eds. 1996. Reducing Space Mission Cost. Torrance, CA: Microcosm Press, and Dordrecht, The Netherlands: Kluwer Academic Publishers. Wertz, James R., 'John T. Collins, Simon Dawson, Hans J. Koenigsmann, and Curtis W. Potterveld. 1997. "Autonomous Constellation Maintenance." Presented at the IAF Workshop on Satellite Constellations, Toulouse, France, Nov. 18-19.